An NRI couple from the US has taken up the task of promoting science among rural students in the Palampur region through simple experiments. 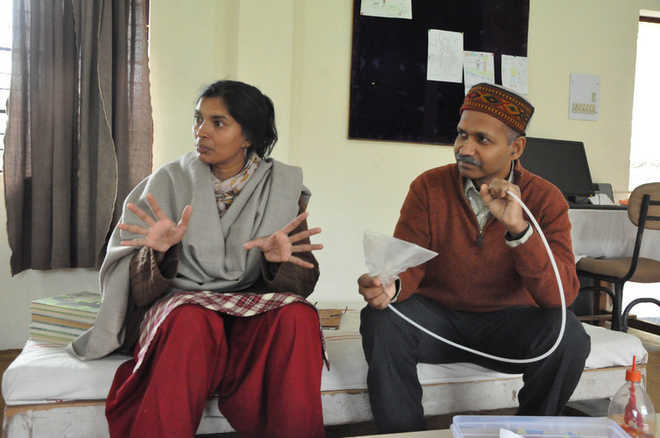 Sandhaya Gupta, who did her PhD on semi conductors from IOWA State University in the US, and her husband, Sarit Sharma, who is also a PhD in electrical engineering from the same university, now run a centre by the name of Avishkar near Palampur. At the centre, simple things such as plastic bottles and pipes are used to make children understand the concept of air pressure and mathematical fractions. Every Sunday, students from across Kangra district gather at Avishkar and perform simple scientific experiments. They also learn about simple mathematical problems through images and visuals. Sandhaya Gupta quipped in: “We started visiting government schools in the area to admit our daughter here. However, we found that though the students had scientific mind, they were not opting for science subjects. In 2009, we got connected to Sambhavana Centre, founded by Prashant Bhushan, and started creating simple experiments to evoke the interest of local students in science. Later, we set up our own centre with the help Palampur Rotary Foundation and Phoola Devi Help Age Foundation. “Now, we carry kits of simple experiments in our car and visit various government schools of the area. The teachers at the schools are generally very helpful. In our visits, we have found that many students have brilliant scientific aptitude but fail in expressing their ideas in writing. We try to help such students in improving their written and communication skills,” she said. Sandhaya is now busy in translating simple scientific literature from English to Hindi so that it can be provided to students in rural areas. She said, “we have slowly been collecting scientific literature for children and now have a library of about 12,000 books that is provided free of cost to students coming to the centre”. The couple is totally dedicated to promoting science among rural students. Besides teaching the rural students of Himachal, they had also adopted many Dalit girl students from Bihar. Once in a while, they go to Bihar and teach them, Sandhya added. Many groups of student from Delhi and Mumbai also visit the Avishkar centre and imbibe the scientific ideas through simple experiments.